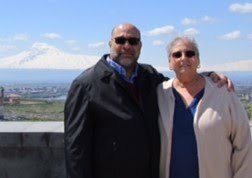 John and Pat Nashmy of North Jersey share the same love of Armenian-Assyrian-Middle Eastern food as we do. Pat, who is part German and part Italian, has mastered some of John’s best-loved family recipes. As a matter of fact, John was so delighted with her recent preparation of Gouvedge, he had to share their recipe and photos with us. John purchased 5 lbs. of lamb neck bones from, as he put it, an outstanding butcher in Wharton, NJ, Sussex Meat Packing. He said, " As the weather has been so miserable with the cold and snow, this was the perfect thing to make. 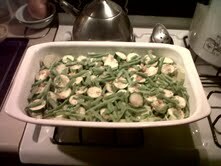 We are again expecting snow and this will be a welcome dish for dinner!" Pat uses the Gouvedge recipe from the "Assyrian Cookbook", created by the women of the Assyrian Orthodox Church of the Virgin Mary, Paramus, N.J., then takes it up a level or two. 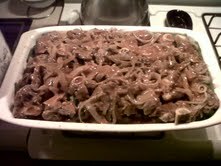 Looks delicious, John and Pat; wish we could have joined you! 1 Medium Eggplant, peeled & cubed. 1 Large Zucchini, peeled & cubed. 1 16oz Package French Cut String Beans. 1 16oz Package Okra, defrosted and tops trimmed. 1/2 Cup Minced Flat Leaf Parsley. 2 Cloves ( to taste ) Garlic, peeled & quartered. 1 Large Can Tomato Paste. 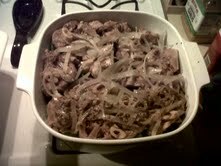 Cook Meat or Neck Bones in water (just to cover) with Sliced Onion, Salt & Pepper until it comes to a boil. Remove meat from pot and add Tomato Paste to make broth. Layer Eggplant starting at bottom, then Zucchini. Season with Salt & Pepper lightly. 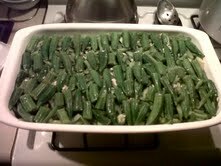 Next layer String Beans & Okra, season again as above. Pour Broth over the entire dish. Season again as above & sprinkle on Paprika & remaining Garlic. Bake covered @ 375 degees F. for 2 Hrs. Bake for an additional 1 Hr uncovered. Baste Meat with Broth during the last 1 Hr. Serve with Bulgar or Rice & Crusty Bread. Those of us whose ancestors hail from Aintab and Marash call this dish Tava or Turlu -- delicious made with our without meat! No matter what you call it or how you spell it, gouvedge or tourlou(turlu)is delicious! 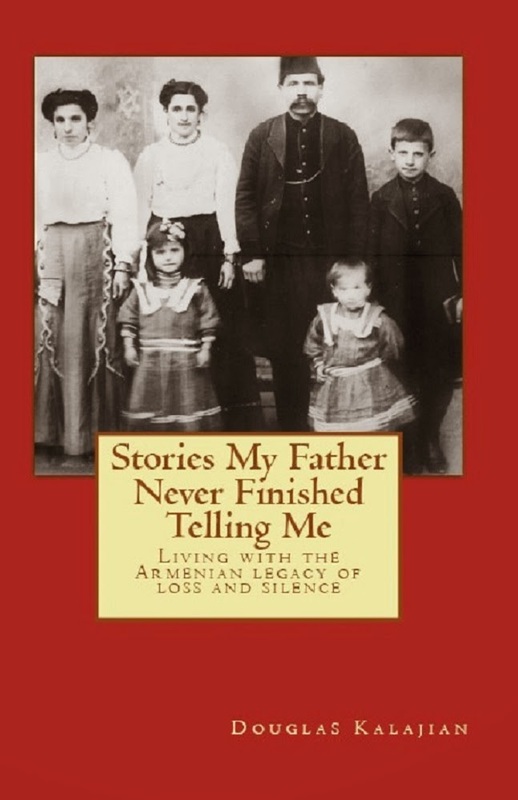 How do I buy a copy of the Assyrian cookbook Pat refernces? My grandmother belonged to that church, but she has long past. in the preparation of gouvedge the special ingredient is the raw(unripe)fruit, such as apple, apricot, plum or green almond. with the vegetables you must put also the unripe fruit.